I have been a longtime fan of La Taqueria and their delicious taco offerings. 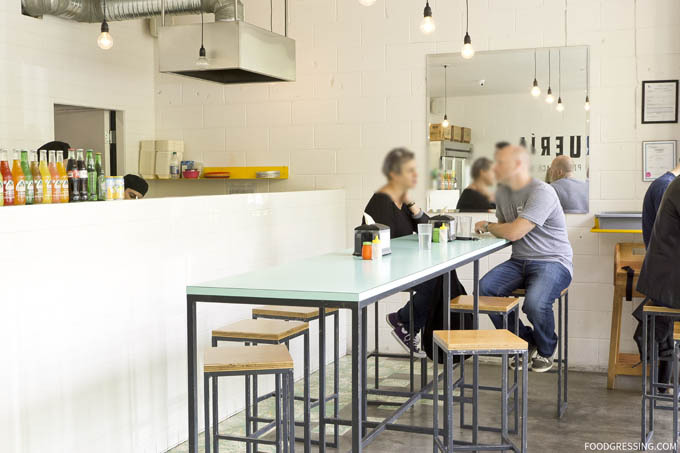 A welcoming atmosphere, friendly service and comforting eats are reasons why La Taqueria is so popular. 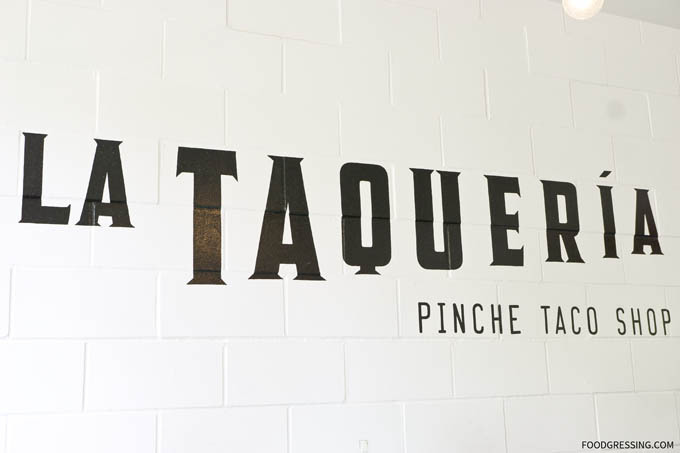 While the restaurant industry has always been tough, La Taqueria has been able to thrive. The proof in their success is their four locations in BC: 2 in Vancouver, 1 in North Shore and 1 in Victoria. 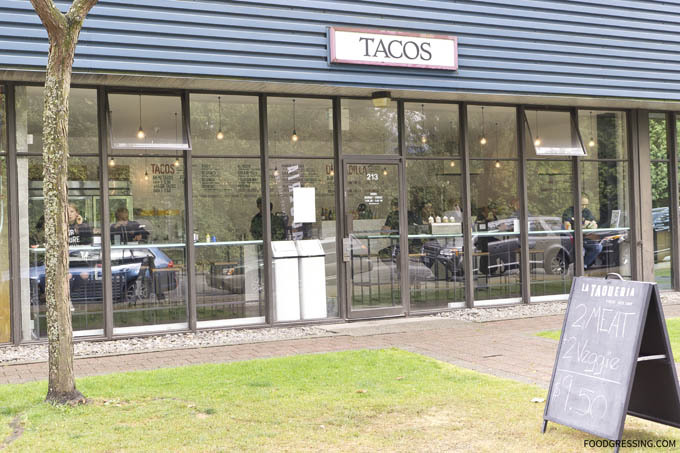 Since I was in North Vancouver for a tasting at MaxFrut yesterday, I decided to visit La Taqueria’s location at 1305 Welch St. It’s an industrial area and their hours are 11 am – 5 pm 7 days a week. The design of the shop resembles that of their Cambie location in Vancouver – inviting, clean and bright with large windows. La Taqueria had announced on Facebook over a week ago that they adding a new taco to their menu – the Baja Taco. 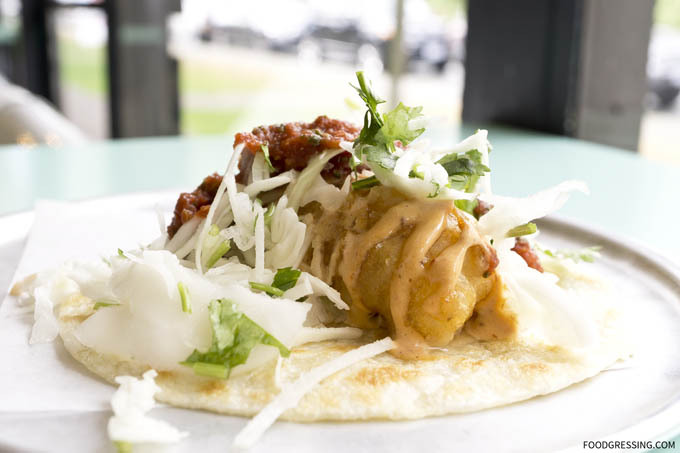 It is made with tempura beer-battered seasonal fish with cabbage, cilantro, salsa Mexicana and chipotle mayo and served on a 6″ hand made tortilla. Having tried most of their tacos in the past, I was eager to try a new variety. When my husband and I went in yesterday, we ordered just that – two Baja tacos priced at $6 each. Regular meat and vegetarian tacos at La Taqueria are $3.00 and $2.50, respectively, so the Baja taco at $6 is quite a premium taco. As for the taste, it didn’t disappoint. I quite enjoyed the crispy batter; the fish was nicely moist; and the toppings tasted fresh. The fried handmade tortilla was a nice touch compared to the “store bought” soft corn tortillas they use for their regular tacos. It was, however, super messy to eat because the creamy chipotle mayo/sauce quickly dripped out onto the table after I picked up the taco. In terms of portions, I still think that two meat tacos for the same price of $6 would still be more satisfying. Their regular tacos each come with two corn tortillas stacked on top of each other, so that undoubtedly makes it more filling. 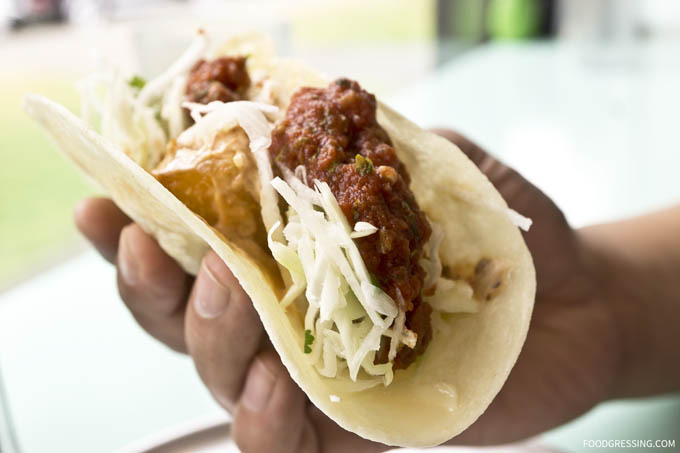 With the Baja Taco, you get just one 6″ hand made tortilla. $6 is still a bit steep for the Baja Taco; $5 might be a more reasonable price.